Choosing any of these Bali beach holiday villas with a chef promises to guarantee utter luxury – regardless of whether you’re celebrating a wedding, looking for a romantic getaway or simply relaxing on a well-deserved family holiday near the beach. This list of some of our favourite villas equipped with a private pool, cooking crew & located a couple of minutes walk from the beach is hand-picked by experts to provide a showcase of indulgence and luxury. Whether you’re looking to explore the path less travelled in Bali or simply kick back in a tropical barefoot paradise, you’re guaranteed to find something you would love. A seductive and avant-garde retreat, Villa Eshara II features delightful interior design, fascinating artwork and captivating furnishings throughout. Conveniently located near enough pleasures to entice all varieties of hedonism, the surrounding spas, boutiques, world-class restaurants and exhilarating nightclubs make this the perfect couples retreat. Naturally, the gorgeous Petitenget Beach is only a few hundred meters away. Whether you are dreaming of a romantic getaway or a family holiday, the highly competent staff of this villa will be on hand to make your experience an unforgettable one. High pitched roofs, glass doors and opulent marble floors add a taste of extravagance to the spacious dining room, equipped for eight guest, where you can enjoy dishes of Indonesian and internarional cuisine prepared by the villa’s chef. Looking for more inspiration? Take a peek at our guide to the most picturesque islands near Bali and start planning your itinerary! Located a stone’s throw from the Sanur beach, Villa Maya is a great example of how luxury can be absolutely affordable if you decided to stay in a beach holiday villa in Bali. Equipped with 4 spacious bedrooms, 3 bathrooms and a charming beachfront outdoor area with a private pool, it fits up to 8 people and represents an amazing retreat for families, couples and groups of friends planning to have the time of their life in Bali. The villa is located at Pabean Beach and surrounded by a river and beautiful rice fields and plantations. It will surprise you spacious interiors that combine modernity with traditional Balinese decor elements, modern kitchen and living room and tropical settings in the outdoor area where you will be swimming and sunbathing will make you fall in love at first sight. Just a stone’s throw away from a fabulous sandy beach lies Villa Cendrawasih, a stylish and contemporary five-bedroom resort perfect for families looking to let their hair down. Those in search of Bali villas with a chef need look no further than this beautiful and accommodating villa. Featuring an eighteen-meter swimming pool, a fully kitted-out gym and an alluring sun terrace, this modern villa has all the comforts you will need to enjoy a once-in-a-lifetime tropical retreat. The mini-bar and shady veranda provide the perfect convivial atmosphere for guests, whilst the roomy roof terrace offers a stunning vista of the swaying coconut palms, expansive ocean and nearby volcano. This luxurious retreat comes with all mod-cons, including satellite TV in each bedroom and hi-fi facilities in the teak-furnished living room. Service from an attentive team including discreet butlers and a talented gourmet chef will ensure that you never have to lift a finger. Nestled within a small fishing town, Villa Bendega Rato is spacious without compromising on privacy – perfect for a tranquil and uninterrupted getaway. The open-planned living and dining area which overlooks this five-star retreats luscious tropical gardens give a unique ambience. Combining style and simplicity, the villa comes to life during the evening, when the atmospheric lighting kicks in. Whilst only the master suite boasts its own plunge pool, sun deck and pavilion, each of the three bedrooms are kitted out with en-suite bathrooms and balconies or outside seating areas. All are incredibly spacious and exquisitely furnished. With an 18-meter grey slate pool, a 55-inch flat-screen TV and a Sonos music system, you can rest assured there will be no shortage of high-quality entertainment. With a rooftop sundeck from which you can catch the dying light of this islands beautiful sunsets, Villa Bendega Rato is truly one of the most luxurious Bali villas with a chef. Hidden in a tranquil location in the heart of Seminyak, villa KawiThe property is about 20 minutes drive from the airport and only a few minutes from the beach and restaurant district of Legian/Oberoi. 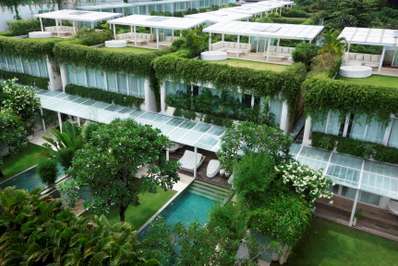 Moreover, you will be able to enjoy the numerous Villa restaurants, bars, spas and shopping places in the Seminyak area. This villa is an ideal option for couples and small families looking for value for money in Bali. Equipped with 2 bedrooms, 2 bathrooms, an open space dining area and a garden with sunbeds and a pool, it has everything you might dream about. Just imagine sitting in the outdoor dining area, watching the sunset and tasting delicious dishes prepared by the villa chef…does not it sound absolutely thrilling? The spacious and luxurious Kaba Kaba Estate is an ideal venue for celebrating weddings or other special occasions with a larger group. Boasting a croquet lawn, one large and three smaller pools, a home-theatre, games room, tennis court, library, gym, and spa – enough to keep the whole family entertained! Beautifully kept grounds which stretch as far as the eye can see give this estate a rare combination of serenity and limitless space which you are unlikely to find in any other luxury pool holiday villas in Bali. Stunning and uninterrupted rice field views stretch all the way up to the nearby volcanoes, whilst the beach is only a short drive away. Fully staffed by a professional and discreet team who offer five-star service, the Kaba Kaba Estate should be your first port of call if you are looking for incomparable entertainment options without having to lift a finger. A divinely comfortable villa which is sure to provide the foundation of your exceptional getaway, it is a must-see for larger groups in search of Bali villas with a chef. If you’re searching for truly gorgeous Bali beach holiday villas with a chef then you would do well to consider Pushpapuri. A stunning four-bedroom villa that is mere meters from the waterfront, this retreat is the ultimate in five-star luxury. The alluring 20-metre infinity edge lap pool is the crown jewel of this spacious retreat, closely following the line of the beach until it reaches the enchanting relaxation pavilion. Also unique to Pushpapuri is the well-furnished games room, fitted with a pool table, dart board and 40-inch LCD satellite TV – perfect for keeping the kids occupied! The standalone living and dining area take full advantage of the splendid ocean vistas, comprising of glass walls on three sides to ensure a postcard-perfect experience. Opening the sliding glass doors to allow the sea breeze glide through will guarantee a truly relaxing experience. Supported by a highly trained villa manager, friendly staff and a professional chef, you can be sure to receive attentive yet discreet service whenever you need. Once-in-a-lifetime views make this one of the most beautiful and unforgettable beach villas in Bali. One of the finest Bali villas with a chef, the Arnalaya Beach House is an architectural masterpiece which blends sophistication with a family friendly welcome. This bespoke location offers a beautiful view of the unspoiled Nelayan beach, overlooking a strip of traditional fisherman’s huts with colourful fishing boats dotted within the water. If you’re looking for Bali beach holiday villas with a chef, Arnalaya Beach House is surely among the finest. Inside, the lounge mixes plush white sofas, traditional bamboo chairs and unique hand-crafted tribal tables, giving an authentic touch to the stylish interior of this luxurious beach house. Seating up to fourteen people, the formal dining area is designed to conjure a social and casual atmosphere, perfect for larger groups. The sublime ocean-facing pavilion offers a built-in barbecue, as well as al-fresco seating and dining with stunning sea views for up to fourteen people. Meters away lies the crystal clear 20m swimming pool, perfect for a quick dip whilst the sun drops below the horizon. With Echo Beach a mere 0.5km walk away, the Arnalaya Beach House is surely one of the finest Bali beach holiday villas with a chef.